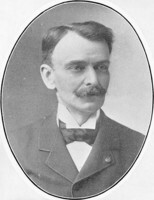 FRÉCHETTE, LOUIS (at his confirmation he added the name Honoré, but he stopped using it in 1880), journalist, writer, lawyer, politician, and office holder; b. 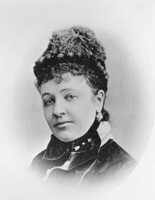 16 Nov. 1839 in Pointe-Lévy (Lévis), Lower Canada, son of Louis Fréchette and Marguerite Martineau; m. 10 July 1876 Emma Beaudry in Montreal, and they had five children; d. there 31 May 1908. Louis Fréchette, whose ancestors were explorers, farmers, and shipwrights, seemed all his life to want to reconcile the sedentary life with the nomadic and to answer the opposing calls of order and adventure. The search for equilibrium proved difficult. Thus Fréchette, an important figure in the history of letters and thought in Quebec, became a bundle of contradictions, far more so than appeared on the surface. In the process his personality gained a deeper humanity and a painful complexity. Fréchette first showed his rebelliousness when he was at college. He was two or three years older than his fellow students and found it difficult to accept the disciplinary rules of the schools he attended. As a result, he went from the Petit Séminaire de Québec to the Collège de Sainte-Anne-de-la-Pocatière, and from there to the Séminaire de Nicolet, where he finished the sixth form (Rhetoric). 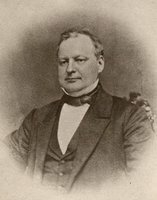 In September 1860, without completing his baccalauréat ès arts (he did not take the final two years, Philosophy), he was accepted into the leading Quebec law firm of François-Xavier Lemieux* and Édouard Rémillard. Fréchette’s education during the next four years was not confined to legal studies. He took the occasional course in law at the Université Laval, but he also enthusiastically embraced the bohemian life: from his garret on Rue du Palais (Côte du Palais), the sounds of revelry echoed through the Latin Quarter. Seeking to rise in society, he put his exceptional talents as a communicator to work. Thus at virtually the same time he entered several fields: journalism, as a reporter for Le Journal de Québec; politics, especially through participation in electoral campaigns for the Conservative party and later the Liberal party; and literary creation. 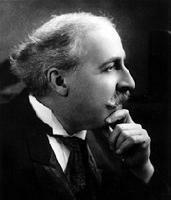 He wrote a play, Félix Poutré . . . , which was performed in November 1862 [see Félix Poutré*], and poems, which appeared in periodicals, in the albums of upper-class young ladies, and in a collection entitled Mes loisirs; poesies, published at Quebec in March 1863. His public life was taking shape, then, in its various dimensions, during these critical years. 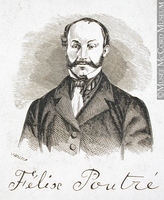 When he was called to the bar of Lower Canada in September 1864, Fréchette opened a law office at Lévis. But since there were not many clients, he became one of the founding editors of the newspaper Le Drapeau de Lévis, which published only four issues. Le Journal de Lévis, of which he became a founder and editor in April 1865, was more successful; he had to leave it after eight months, however, for reasons that are unclear. Since he was then personally facing a financial crisis, he decided to leave the country. Many years later he would claim that the religious authorities of his parish had jeopardized his career as a lawyer and as a Liberal journalist; it is also possible that, as an outspoken opponent of the proposed confederation of the British North American colonies, he may have disclosed the local defence system to a Fenian spy, thus arousing the suspicions of the political authorities. 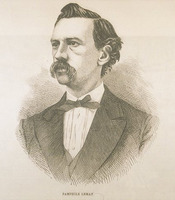 In November 1866 Fréchette went to Chicago and he soon was involved in the French Canadian and French communities. He was asked to set up a branch of the Société Saint-Jean-Baptiste, where he disseminated his annexationist ideas. His belligerent attitude towards the Conservative government of the Province of Canada, the major participant in confederation, informed his first polemical work, La voix d’un exilé . . . , a diatribe in verse reminiscent of Victor Hugo, which he sent in three instalments ( I 867, 1868, 1869) to the leading French Liberal newspapers of his native province and which was also published in book form in Chicago. As a journalist, he wrote for L’Observateur de Chicago during the early months of 1867, and in the summer of 1868 he participated, as editor, in founding L’Amérique, the organ of the Republican party among the French groups in the city. In the meantime, he had become corresponding secretary for the lands department of the Illinois Central Railroad. All went well until the beginning of September 1870. During July and August, just at the outbreak of the Franco-German War, Fréchette had been on the south shore of the St Lawrence briskly conducting a campaign in favour of annexation to the United States. The acting editor of L’Amérique, a German-speaking Swiss, published articles hostile to France, the Republican party having taken a stand in favour of Prussia. Hundreds of readers of French origin cancelled their subscriptions and when Fréchette returned to Chicago in September he was again out of a job. Perhaps the American dream began to turn sour. No matter: it would take more than this setback to disconcert Fréchette, who was never at wits’ end. After wandering about Louisiana for some three months, possibly as correspondent for an American newspaper or two, the man who had chosen exile returned to Quebec late in February 1871. A provincial general election was in the offing, and Fréchette, who was nominated as the Liberal candidate in Lévis, bent his efforts to win a seat in the Legislative Assembly. On 20 June 1871 his attempt failed. To console himself, he published a pamphlet entitled Lettres à Basile . 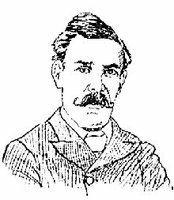 . . (Québec, 1872), which consisted of polemical articles attacking Adolphe-Basile Routhier*, a young ultramontanist lawyer with a bright future. He also began energetically preparing for the federal election of the summer of 1872, this time under the banner of the Parti National (a front for the Liberal party, whose very name caused Catholic voters to bristle). Again he was defeated, but on 29 Jan. 1874, on the tide of a reversal in Canadian public opinion that brought Alexander Mackenzie* and his cohorts to power, he finally became the Liberal member for Lévis in the House of Commons. He held his seat until the election of 1878, when he lost, as he also did in 1882. Fréchette’s lack of success in politics had the beneficial effect of leaving him more time to pursue his literary career. After his marriage to Emma Beaudry, the daughter of Jean-Baptiste Beaudry, a rich merchant, landowner, and banker of Montreal, and the niece of Jean-Louis Beaudry*, a well-known mayor of the city, he did more writing. Near the end of his term in parliament, he published a third collection of poems, Pêle-mêle: fantaisies et souvenirs poétiques, issued at Montreal in June 1877, and sent copies to dozens of prominent figures in French literary and political circles. A sympathetic reception in France encouraged him to venture further. With little hesitation he submitted to the annual competition of the Académie Française two short collections published for the purpose early in 1879: Poésies choisies and Les oiseaux de neige: sonnets. 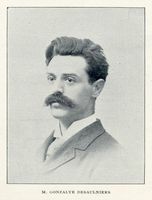 In June 1880, shortly after he and his wife moved to Montreal, and at the time when his two plays Papineau . . . and Le retour de l’exilé . . . were opening for alternating performances, he received a telegram with word that the Académie Française had awarded him one of its most important Montyon prizes – the first honour of this kind ever bestowed by a European nation on a Canadian citizen. The news created a stir. But glory always has its dark side. When he returned from France, where he had gone to accept his prize and where his idol, Victor Hugo, had granted him a brief interview, the laureate (a somewhat ironic title that would haunt him for the rest of his life) was given a mixed reception by his fellow citizens. His friends organized sumptuous banquets in his honour, while his enemies heaped insidious criticisms on him (they trumped up accusations of plagiarism, which became a torment to him, like the blood-soaked tunic of Nessus). Their hostility was the prelude to a campaign of defamation that became nastier over the years. 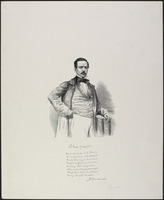 Because of his new prestige as a poet, Conservatives in general and ultramontanists in particular found Fréchette a more formidable adversary than ever, especially since he put his talents as a writer at the service of radical liberalism by contributing, from its inception in May 1879, to La Patrie, a newspaper owned by Honoré Beaugrand who was a well-known freemason. In fact, in the back rooms of conservatism it was believed (and with some justification) that if the Académie Française departed from custom by awarding a prize to a writer of some nationality other than French, its action was to be explained more by his ideological support for the Third Republic than by the aesthetic merit of his writing. Fréchette himself (for the fun of it) gave substance to this suspicion by freely sprinkling his newspaper columns with examples of republican bias. In 1883 he attained one of the pinnacles of his “red” partisanship by publishing, under the pseudonym Cyprien, Petite histoire des rois de France, a vicious pamphlet in which, using the weapons of masonic argumentation, he exercised his wit to befuddle the reader. On 12 May 1884 Fréchette became editor-in-chief of La Patrie. He held this position for only about 15 months, however, for in July 1885 he left the paper in protest against Beaugrand’s opposition to certain Liberal leaders, including Honoré Mercier*. He moved to Nicolet and withdrew from public life, but only for a short time. In the early months of 1887, at the request of his leaders, he joined the Liberal party’s federal election campaign and travelled across Canada. 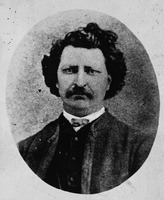 Although the Conservatives were returned to power in Ottawa, in October 1886 Mercier had gained ground in the provincial elections in Quebec at the head of the Parti National, which he had founded following the Riel affair [see Louis Riel*], and in January 1887 he had become premier. Fréchette waited no longer; he thought the time had come for him to be given the just reward for his more than 15 years of loyal service to the Liberal cause, and he let it be known to all concerned that he had his eye on the post of Quebec chargé d’affaires in Paris. When his efforts proved fruitless, he spread rumours that the ingratitude of his Liberal friends was obliging him once again to seek his fortune abroad. And so, on 9 May 1887, he left for France with the immediate intention of carrying out some publishing projects and the long-term goal of settling there permanently with his wife and three children, Louis-Joseph (b. 1877), Jeanne (b. 1879), and Louise (b. 1881). Their fourth child, Charles-Auguste, had died in 1883, when he was just four months old, and their youngest daughter, Pauline, was not born until 1889. At first all went well. Through the friendship of Adine Riom, a well-known writer from Brittany, Fréchette, now a voluntary exile for the second time, had the use of a country house at Pellerin. In this picturesque village on the Loire a few miles southwest of Nantes, he had peace and quiet to complete the manuscript of an ambitious collection of poems which he called “Les épopées nationales.” It was published in November 1887 in Paris under the title La légende d’un peuple and was undoubtedly his most famous (if not most polished) work of poetry. In addition, through some useful connections, he was able to give lectures, usually about Canada, first in Nantes and later in Paris, where he met such established writers as Émile Augier, François Coppée, Leconte de Lisle, Xavier Marmier, Théodore de Banville, and Jules Claretie. But at Rouen he suddenly found himself in a state of malaise which forced him to abandon his plans for a career in France, and on 10 Dec. 1887 he sailed for New York. On his return to Nicolet he fell into a depression, aware that he was going through “one of the most serious crises of my life.” There were urgent appeals to the leaders of the Liberal party for a sinecure. This time, but only after he had waited impatiently and nervously for more than a year, his efforts were crowned with success. On 5 April 1889 Mercier, perhaps on the intervention of Wilfrid Laurier*, appointed him clerk of the Legislative Council. 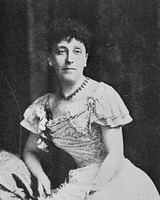 Fréchette was living in Montreal at the time, having been able, thanks to a reconciliation with Beaugrand, to rejoin the staff of La Patrie in October 1888. The most stormy period in Fréchette’s journalistic career now began. It might have been supposed that the honourable clerk, a founding member in May 1891 of the French section of the Royal Society of Canada, a chevalier of the Legion of Honour, and the author of a recently published collection of peaceful and retrospective lyric poems (Feuilles volantes, November 1890), who suffered periodically from attacks of rheumatoid arthritis, would stand aside from ideological struggles. The reverse proved the case. He became a member of the editorial staff of Le Canada artistique (Montréal) and later of Canada-Revue (Montréal), the radical magazine of Aristide Filiatreault*. 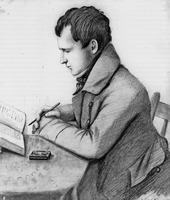 For them Fréchette wrote literary articles under his own name (such as the serial Originaux et détraqués . . . , which was published from 23 July 1892 to 4 March 1893, and would go on sale as a complete work in June 1893) and polemical anticlerical columns under various pseudonyms. This militant outpouring intensified in March 1893, when La Patrie published the first of his letters on education. In August he put the letters together in a pamphlet entitled À propos d’éducation. . . . Addressed to Abbé Frédéric-Alexandre Baillargé, a professor at the Collège Joliette, they prompted Archbishop Édouard-Charles Fabre* of Montreal to relegate Baillargé to the duties of a parish priest. The following year there was another series of open letters, which Fréchette addressed this time to Father Pierre-Zacharie Lacasse*, a well-known Oblate who organized parish retreats in many rural localities in Quebec and was the author of a number of widely distributed pamphlets on popular education. The letters brought a change in Lacasse’s apostolic career, since Fabre transferred him out of his diocese. 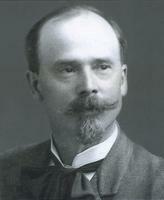 During those crucial years Fréchette, through these and several dozen other publications, assisted a campaign aimed at destabilizing clerical power which Liberals and their allies were conducting in Quebec in preparation for the federal election of 1896 and the provincial election of 1897, both of which they won. The last decade of Fréchette’s life was complicated, to say the least. 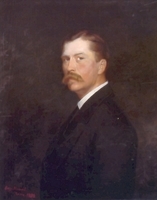 He went through bitter times with the tragic death of his son Louis-Joseph and with serious attacks of depression, but he also had times of great joy with the marriages of his elder daughters: Jeanne to Honoré Mercier*, son of the former premier, and Louise to Henri-Alphonse Béïque, son of the senator and bank president Frédéric-Ligori Béïque*. Official recognition of his pre-eminence in the social and cultural world came. In May 1898 he was awarded the honorary presidency of the École Littéraire de Montréal as an expression of gratitude from young writers to their senior colleague who had given them his support from the outset. In 1900 he was chosen president of the Royal Society of Canada. In 1905–6 he was chairman of the committee to erect the monument to Octave Crémazie*, a public homage that he had long wanted to pay the first great French Canadian poet. His literary output kept pace. Veronica, a pseudo-romantic, five-act melodrama in verse, was published in part in 1900 and performed in 1903, albeit with limited success. Christmas in French Canada, a collection of stories, came out in an English edition in 1899, to be followed the next year by the French edition, La Noël au Canada. In 1900–1 Le Monde illustré (Montréal) published in serial form his recollections of his childhood, which would appear in book form 60 years later under the title Mémoires intimes, undoubtedly one of the most appealing of his works. 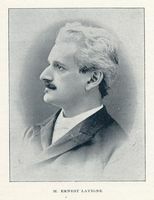 Around 1903, cognizant of the scope and diversity of his literary output, Fréchette made careful preparations for the publication of his complete works in 16 volumes. But the search for a publisher proved disappointing. Only Beauchemin [see Charles-Odilon Beauchemin*] would undertake the project, and the contract signed on 14 Jan. 1908 covered just the three volumes of Poésies choisies (I: La légende d’un peuple; II: Feuilles volantes and Oiseaux de neige; III: Épaves poétiques and Veronica). But Fréchette would not live to see them in print. On the evening of 30 May 1908, on the doorstep of the Institution des Sourdes-Muettes where he and his wife had been living for the previous year, he suffered a stroke. He died 24 hours later without regaining consciousness. The highly subjective nature of these testimonials does not take away from their validity. The work and career of Fréchette, who with such energy kept himself in the forefront of ideas, literature, and culture, were outstanding, despite certain blunders. He became the prime force, in his day, in the creation of French Canadian literature by his pioneering in poetry and drama, his success as pamphleteer and short-story writer, and his contributions to many periodicals and cultural or literary societies in Quebec, France, and the United States. In his determination to live by the pen, and in his efforts to promote the status of writers (he took a keen interest in copyright matters, and several times proudly listed himself in the Montreal directory as “poet”), Fréchette gave legitimacy to working in the field of literature. At the same time he remained an important cog in the quiet but powerful Liberal machine. AC, Montréal, État civil, Catholiques, Cimetière Notre-Dame-des-Neiges (Montréal), 3 juin 1908. ANQ-M, CE1-33, 10 juill. 1876; P-133. ANQ-Q, CE1-19, 17 nov. 1839; P-86. NA, MG 29, D40. Henri d’Arles [Henri Beaudé], Louis Fréchette (Toronto, ), 1–23. Alexandre Belisle, Histoire de la presse franco-américaine . . . (Worcester, Mass., 1911), 540. L.-M. Darveau, Nos hommes de lettres (Montréal, 1873), 178–210. L.-O. David, Souvenirs et biographies, 1870–1910 (Montréal, 1911), 153–78. DOLQ, vol.1. G.-A. Drolet, Zouaviana; étape de trente ans, 1868–1898 . . . (2e éd., Montréal, 1898), 245–55. 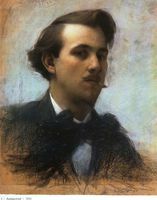 Marcel Dugas, Un romantique canadien: Louis Fréchette, 1839–1908 (Paris, 1934). Louis Fréchette, Fréchette, Michel Dassonville, édit. (Montréal et Paris, ). Charles ab der Halden, Études de littérature canadienne-française, introd. 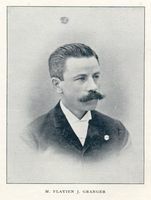 de Louis Herbette (Paris, 1904). G.-A. Klinck, Louis Fréchette, prosateur: une réestimation de son œuvre (Lévis, Qué., 1955). Séraphin Marion, Les lettres canadiennes d’autrefois (9v., Hull, Qué., et Ottawa, 1939–58), 9. Guy Monette, “La polémique autour de La voix d’un exilé ou le chant du cygne de l’immanentisme au Québec,” Voix et Images (Montréal), 2 (1976–77): 334–55. Lucien Serre, Louis Fréchette: notes pour servir à la biographie du poète (Montréal, ). Paul Wyczynski, “Louis Fréchette et le théâtre,” Le théâtre canadien-français (Montréal, ), 137–65. Jacques Blais, “FRÉCHETTE, LOUIS,” in Dictionary of Canadian Biography, vol. 13, University of Toronto/Université Laval, 2003–, accessed April 23, 2019, http://www.biographi.ca/en/bio/frechette_louis_13E.html.